What Reptile Should I Get? There are many things to consider before getting a pet reptile. Some of the most common reptiles you will see in a pet store are some of the most difficult ones to care. Before getting into specific care issues, though, let's discuss more general issues that should be considered before deciding on a pet reptile. Some are general and some are quite specific but many areas have enacted laws pertaining to keeping exotic reptiles as pets. In many places any reptiles that are considered dangerous (venomous snakes, alligators, etc.) are illegal but some places are even more restrictive (such as all constricting snakes). The first step in deciding on whether a reptile is the right pet for you is finding out whether you can even have one where you live. All reptile owners need to be informed about Salmonella infections. 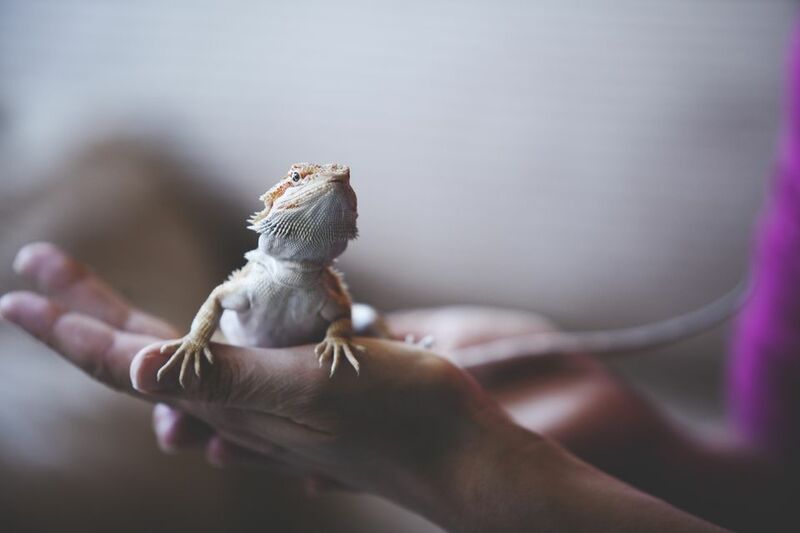 The risks shouldn't keep most people from keeping reptiles since with the proper management and hygiene they are minimal but the US Centers for Disease Control (CDC) recommends that certain risk groups should be careful about contact with reptiles and amphibians. Many problems with keeping reptiles can be traced back to not providing the proper environmental conditions, particularly heat. Providing proper heat and light to captive reptiles is often quite expensive but is absolutely essential to keeping pet reptiles healthy. It is important to find out exactly what conditions your reptile needs and never cut corners when it comes to providing those conditions! Captive bred reptiles are usually healthier, legally bred, and by purchasing from a supplier (whether it is a breeder or pet store) you know you won't be contributing to depleting the wild population of the species. It is important to keep in mind that depending on where you get a reptile it may be very stressed, dehydrated, and prone to illness. There are some things you can look for in your potential reptiles to make sure you aren't buying an unhealthy pet. Though it can be tempting to try and set up your own mini-ecosystem there is just not enough space in a typical home enclosure to keep them all safe and provide them with the best habitats for their species. As a basic rule, only certain lizards are good for beginners. Many species have fairly complex care requirements for their heating, lighting and diet. Some are quite delicate and difficult to care for and others get quite large and aggressive. The are a few species that are quite hardy and easy to tame and these are the best lizards for beginners. Leopard Geckos—They have no special ultraviolet lighting required and are relatively easy to tame and handle. Some other geckos are good choices for beginners such as crested geckos, fat tailed geckos, and house geckos (although house geckos are usually too fast to be good for handling). On the other hand, some lizards are not recommended for beginners based on their more complicated care or size. Iguanas—These lizards get very large and can sometimes be aggressive. They require large enclosures and most people are unable to give the the proper care. Chameleons—Most species have very specific care requirements and are easily stressed. Turtles are not easy or low-maintenance reptiles. Generally, turtles (including the commonly found red eared sliders) are messy, long-lived, get quite large (so they need large housing), and need exposure to ultraviolet light. If you can deal with these factors and commit to caring for a turtle over its long life span, a turtle might be a good pet for you. By far, the most important factor in caring for a turtle is knowing the proper dietary and environmental needs of the species you choose.